White Borscht is a tasty Polish Easter soup that is full of sausage, eggs, potatoes, and other ingredients that bring a lot of religious symbolism to each bite of this delicious soup. 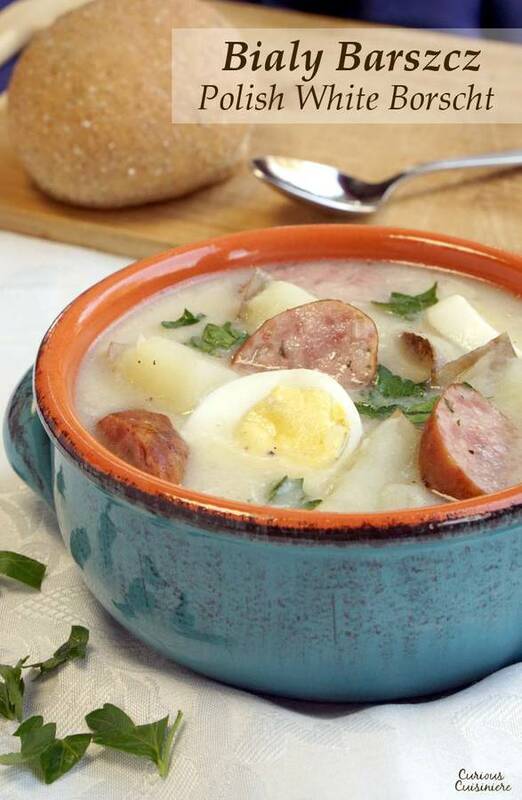 White borscht (or Bialy Barszcz in Polish) is a classic Polish dish eaten on Easter Sunday morning. 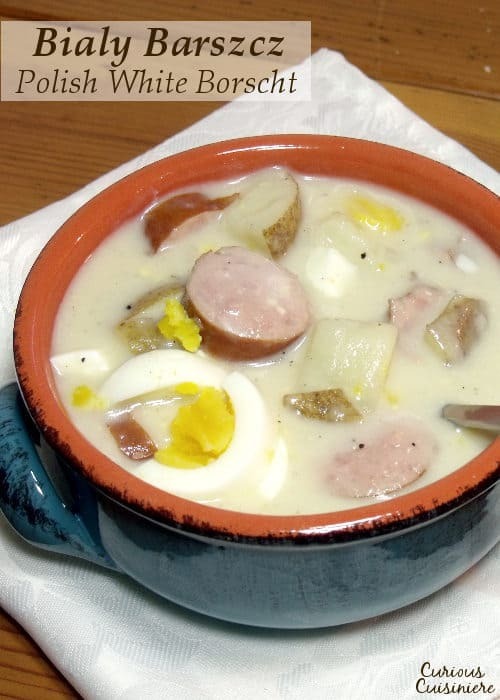 Traditionally, this soup is made with items in the basket of food that Polish families take to Church to have blessed on Holy Saturday. We never realized that blessing baskets of food on Holy Saturday is a tradition in many cultures. In the States, we’re used to Easter baskets for the kids on Easter morning, but this tradition has long standing roots in the baskets that families would bring to Church to have blessed on Holy Saturday. These Easter baskets were filled with things that symbolized every part of life, and their blessing was considered a sign of blessing for a bountiful year ahead. In Poland, the practice of blessing Easter baskets dates back to the early 15th century. Each family brings a large basket to church on Holy Saturday. These baskets are lined and covered with a white linen cloth, representing the shroud of Christ. And, each of the foods in the Easter basket has a special significance. Bacon is a symbol of the abundance of God’s mercy. Easter bread symbolizes Christ, the Bread of Life. Butter or other dairy products celebrate the end of Lent and the richness of salvation. A candle, while not edible, symbolizes Jesus, the light of the World. Cheese reminds Christians of moderation. Hard cooked eggs are signs of hope in new life. Ham or other meats symbolize the abundance of the celebration of the Resurrection. Sausage links represent the chains of death that were broken by Christ’s resurrection. Horseradish is a reminder of the bitterness of the Passion and the sour wine given to Christ at the Crucifixion. Now, that’s a lot of food! Not every basket has to contain all of these items, but the important things is that every family member has a bite of blessed food from the basket. 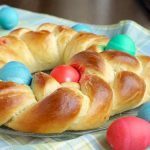 So, Polish mothers typically include foods that they will be using at Easter breakfast or dinner, and a few daily staples. It’s almost as if this soup was designed to be a soup made from the blessed ingredients! Ingredients in white borscht do vary greatly by region and family. With meats ranging from Polish sausage, to ham and bacon; and add ins including sour cream, buttermilk, vinegar and sugar. The two elements that do not change are the sausage-water base and some type of sour (kwas) used to flavor the soup. What’s The Difference Between Red Borscht And White Borscht? But it would be easier to talk about what characteristic these two, seemingly VERY different, soups share. The one thing that these two soups have in common is that they are both considered sour soups. 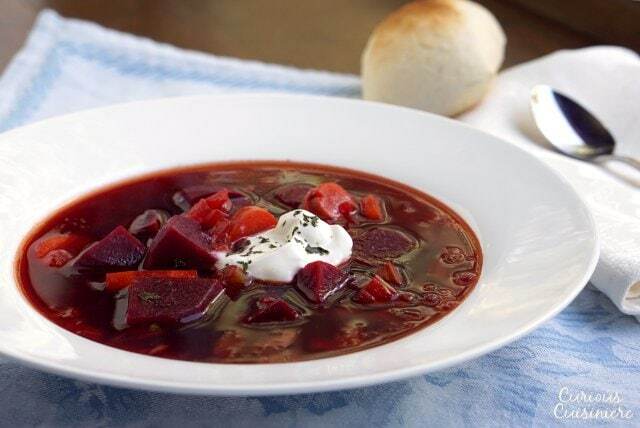 Red borscht uses a splash of apple cider vinegar near the end of cooking time to give a slight sour brightness. White borscht uses a sour starter (kwas) as a base, which gives the soup an underlying taste that is similar to sour cream. Same name, different color. Try traditional Polish Red Borscht. What Is Polish Sour Starter? Kwas (pronounced kvas) is a sour starter (similar to a sourdough starter) that is traditoinally made by fermenting rye bread. This fermentation technique is actually quite popular in many Slavic countries. In Poland, you will find another soup, very similar to bialy barszcz, called zur or zurek. The only difference is that zurek uses the kwas rye sour starter, while the bialy barszcz uses a wheat starter. Tim was a bit skeptical about using fermented bread as a base for the soup, so we went a more non-traditional route and used a mixture of sour cream and flour to give a sour taste and thickness to our soup. The resulting soup is creamy with a mildly sour flavor. While flavor of this soup is slightly different than if you would use the traditional sour bread starter, we found the flavors to be incredibly similar to the bialy barszcz that we tasted during our trip to Poland. It made us happy to discover that sour cream does work quite well as an easy adaptation to stand in for the more traditional ingredients! We’ve made it numerous times since our trip, and love the way the flavors of this soup transport us right back to Krakow. 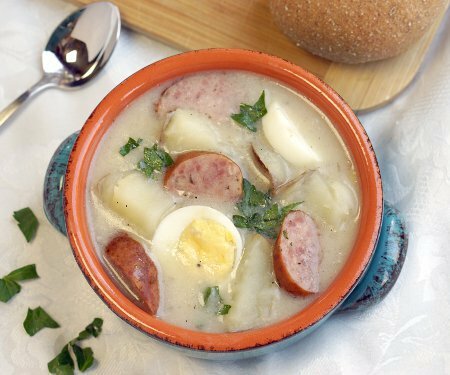 White Borscht is a tasty Polish Easter soup that is full of ingredients carrying religious symbolism. Bring keilbassa and water to a boil in a large dutch oven or heavy bottomed soup pot. Boil 25 minutes. 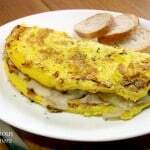 Remove keilbassa to a plate and set aside. Leave the broth in the dutch oven. In a medium, non-stick skillet, saute garlic and onion with a tsp of butter until soft, 5 min. Add onion mixture to kielbassa broth. Add diced potatoes, bay, salt, and pepper. Cook until potatoes are tender, 15-20 min. In a small bowl, whisk flour and sour cream together until smooth. Add ½ c of the soup broth to the sour cream mixture and whisk until smooth and thin. Pour mixture into the soup, stirring constantly. Simmer, stirring often, until thickened, 10 min. 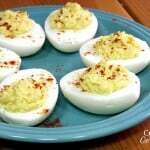 Cut the kielbasas into 1/2 inch slices, chop the hard boiled eggs. Add both to the soup. Taste the soup and adjust the salt an pepper as desired. Cook 1-2 minutes to heat through. *To hard boil eggs: Place eggs in a medium pot. Cover with water and add 1 Tbsp salt (to make peeling the eggs easier). Bring the pot to a boil over medium heat (20 mintues). Turn off the heat and let the eggs stand in the hot water for 3-5 minutes, depending on how firm you like your eggs. Remove the eggs and place them in a bowl of ice water to cool. My Babci’s borscht is a little different. We didn’t use potatoes, and we always used pumpernickel bread. Also, we would Never leave hard boiled eggs like that. Everyone had a separate dish to peel their egg, and we could cut up the whites in our bowl first, and then mash the yolks fine enough that they would liquefy when we added the hot broth. I don’t even know how old my grandmother is anymore, past 90, although she still turns 39 every year. All of our meals were largely Italian (Italian grandfather, Polish grandmother), but I’m glad she wouldn’t budge on the Easter meal–Easter became my favorite holiday because of the food! So glad you enjoy it and that our recipe can help you continue your Babci’s tradition! Hi Sarah. This will be my first Easter with white borsch. My question is can this borsch be made ahead of time ? Hi Catherine. Yes, you can make this ahead of time. I would recommend adding the hard boiled eggs after re-heating, and just before serving. You’ll also want to reheat it gently, stirring often. And, when you first cook it, stop just before the potatoes are tender, so that they don’t get too soft when you reheat it. Enjoy! Haven’t YET made this but plan to as our little girl’s 4-H club chose Poland for this year’s International Night -and our kids are ALL about food! Who’d think kiddies would be excited about goat cheese their Lamancha Dairy goats produce, but mix it with Nutella and they’re dipping Chocolate Chip Teddy Grahams in it like there’s NO TOMORROW! As the chose their country this year, the roundtable talks focused on what food they wanted to EAT, and apparently kielbasa and Pierogi’s won out over everything they could think of! 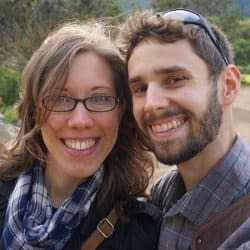 Our club always does a practice run pot luck for just ourselves (to ensure dishes turn-out for the publoc’s consumption on International Night), so when we googled YUMMY POLISH FOOD and saw YOUR pic, they all clamored for it, so it’s off to Florida, a nearby town here in NY as they have a large Polish bakery…-but they also have pics of kielbasa and jarred veggies too, so they must be more than just a bakery), planning to show them YOUR pic and wondering how rye bread bowls would work, if it’s thick enough? -and wondered if we could possibly leave out horseradish (as I got awfully sick once when I ate radish in a salad).? Not sure if you’ll be able to reply this week when we’ll be making this, but I’ll check back! Thanks and we’ll be sure to post results after our pot luck Friday!! Hi Anne Marie! 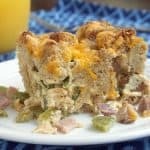 How fun that the kids are so excited to try new foods, and we’re so excited that you’ll be trying our recipe! Yes, you can definitely leave out the horseradish. Rye bread bowls would be such a fun way to eat this soup! I would just make sure the walls are thick or the bowls have a nice crust to them. Talking to the bakery would be the best bet to see if they think their rye bread would stand up well to a hearty soup. We are so excited to hear how this turns out for you! If you’re on Facebook or Instagram, we’d love for you to post some pictures of how it turns out and tag us! (https://www.facebook.com/CuriousCuisiniere or https://www.instagram.com/curiouscuisiniere/) Enjoy! Thanks, we don’t do Facebook buy our club leader does, she knows all about FB so she’ll do that, I’ll relay that to her. And the Polish Deli Bakery owner sent me home 6lbs of kielbasa AND a jar of Sour Ryemeal starter, but saw your recipe-liked it- and still said to use sourcream as in your recipe…even said to call as we’re making it with any questions! Didn’t recommend rye bowls, so we’ll serve with rye chunks! Will be sure to let u know how it turns out and pic on FB. Thanks for making this sooo much fun! Sounds so delicious! What a fun experience this is for you and the girls! We’re looking forward to seeing your pictures! Your Polish White Borscht was a big hit at our 4H pot luck tonight!! I joined instagram and hopefully successfully tagged you with a pic of our borscht! We used the sour rye starter from the Polish specialty store and also used the sour cream and since the kielbasa tasted so much like hot dogs, we served sourkraut on the side and lots of folks added it to the borscht, very creamy, lovely rich flavor. The Polish Specialty store owner also recommended the carrots and celery, so our variation has a bit of color! Very pleased with the results, so thank you for posting your recipe and making our spotlight on Poland for 4H International Night a delishious hit, I’m sure it will go over well considering how well-received it was tonight on our dry-run! Hope you see the pic I sent you on instagram! We did see the pictures! Thank you so much for sharing! Your soup and the entire pot luck looks fantastic! We’re so glad you’re enjoying the recipe and it’s helping your kids learn about Poland! This is very similar to what my grandma and now my mom makes! We put ham, kiebasi, rye bread, homemade cheese, horseradish, and eggs in our soup and the broth is ham based. I do like the idea of the potatoes. Maybe we will try that next year. Your version sounds delicious! I love the addition of homemade cheese! Hi, this looks lovely and I’m going to try it soon. I was wondering if instead of a separate pot in which to boil eggs, can the eggs just be added to the broth while cooking the sausage the initial 20 minutes to enrich the broth with calcium? What a great idea! I would probably only keep the eggs in the boiling broth for 5 minutes or so, just so they don’t over-cook. If you try it, be sure to stop back by and let us know how it turns out! A dozen hardboiled eggs. Eleven of them decorated and sill in the shell. These were the 11 apostles still with Jesus but in hiding. The12th egg was the one that usually cracked when it was cooked. This represents the risen Christ, “out of he shell”. A new life! Bread and wine were what Christ used at the last supper. Salt is the salt of the earth, while pepper is the spice of life. A butter lamb is the fat of the land in the form of a lamb, the Lamb of God. Horseradish represents the bitterness of Christ’s suffering. Polish Sausage, mangled, bloody meat is the mangled body of Christ. Ham is the new covenant. Jews did not eat pork. Candy is the sweetness of life and the promise of heaven. Thank you for this recipe. 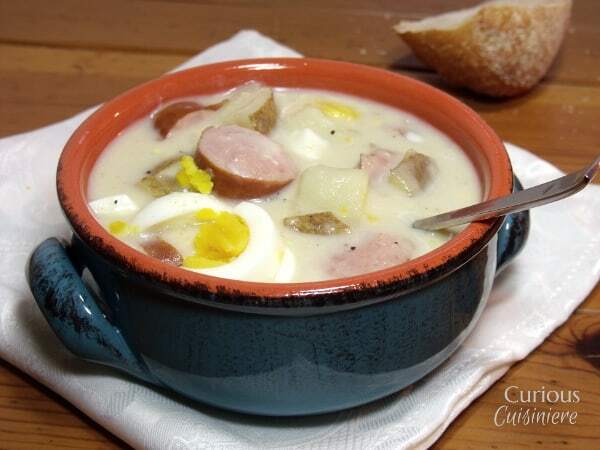 I just made this for my 5 children but made it vegetarian using vegan kielbasa, vegan sour cream and farm fresh eggs…it was a hit and brought back memories of Easter meals with my Polish grandmother. How fun! So glad you enjoyed it! It might be that your sour cream was a bit thicker than ours. It’s not a problem at all! Enjoy! Eating it now! Had to leave a comment! What a successful recipe! 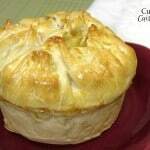 I highly recommend and am very grateful for your recipe! Followed it exactly but used corn starch instead of flour! It’s nice to get in touch with my polish roots! I can’t get over how good it is and that I had all the ingredients! Anyone can make this! Thanks for commenting Jane! We’re so glad you enjoyed the borscht! Hi Victoria. You can copy the URL link in the top of your browser, and send it to her that way! Enjoy! Sounds tasty! We love hearing all the different family variations! We have this every Easter. Broth is from boiled sausage, eggs, ham, bacon, rye bread, platzek(? ), horseradish, holy water, vinegar, and farmers’ cheese. Delicious! Thanks for sharing your version! It sounds tasty! I make this every Easter. We call it Zur. My grandmother (Buscia) made it, my mother made it and now I make it. Mine is made from the stock of both fresh and smoked polish sausage. After I remove the sausage I add sour cream, raw eggs and flour. Then a bit of sugar and white vinegar and of course salt and pepper. We put ham polish sausage , hard oiled eggs, rye bread and red horseradish in the bowl and then the soup. Three of my four kids like it and a few of the in-laws and even some of the grandchildren. One year I didn’t make it and they were like, where’s the soup. So I now make it every year. Your version sounds wonderful Sharon! Thanks for sharing! That is looked forward to and enjoyed. Happy Easter Carol! What a fun tradition and such a great way to keep the family heritage alive! Thanks for sharing! What is sour salt? How do you make it? Sour Salt is actually Citric Acid , extracted from citrus and acidic fruits-lemons, oranges, pineapples it could also be called Citric Salt. Used mostly in Borscht, I find it in Kosher section of Store. Or a smaller Polish Market. I really enjoy learning about the history and culture behind the dish and a big fan of your site. How you made this without even using zakwas makes me question the authenticity of any other recipe on here.. 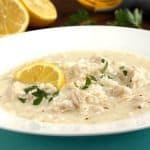 Anyone who has made this soup the right way will tell you the flavor is completely different than sour cream, it’s more similar to soups that call for sauerkraut but completely unique. You can even find zurek concentrates in polish stores or off amazon, it’s not that hard and completes the soup. Hi Agnieszka, Thank you for your comment! As we mention in the post, the soup is traditionally made with a sour starter. But, our version is an adaptation to give a similar flavor for those who don’t have access to that ingredient or for those for whom the sour starter might seem a bit strange. 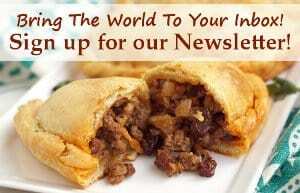 Our whole goal here at Curious Cuisiniere is to make traditional global flavors accessible to everyone, and sometimes that does mean making adaptations from traditional ingredients or cooking methods to make the dishes more easily relatable, while still bringing in traditional flavors and history. With regards to this soup, we have actually had Bialy Barszcz in Poland, and found it to taste very similar to our adapted version here. While, yes, using the sour starter is more authentic, many people have found this version to be a great alternative. Thanks again for stopping by and for your comment! I usually use a soup starter but this year have not been able to vet to the polish store in time due to work schedule (and the store is 30 min away). So this will be an acceptable option for me. I’m sure my kids will love it. Can’t wait to try it. Next year will be ordering soup starter via mail well in advance!!! We hope you enjoy the soup Violet! I cant wait to make it all my polish family died and my dad is the only one left . I hoping it comes out like he remembers. Use fresh polish sausage if you must use the sausage. and Day old rye Bread. or as a real treat use spare ribs and sauer kraut in all of the above. In our hometown we had a lot of Polish Butchers and they always had fresh polish sausage available with the natural casings and the best ribs. For Easter they’d make and sell Butter Lambs, But this goes back 40 years ago and most of them are out of business, Ethnic foods especially from Europe are now very rare. That is very true Mark. If you live in a place that still has a Polish Butcher, you are VERY lucky! Thanks for sharing your thoughts! I still make the soup for Easter and then the mushroom soup for Xmas Eve. How wonderful! Both are such great soups! This recipe sounds very similar to one my family adopted from a newspaper back in the 40s. That one had green peas and green beans also as well as a spice basket containing whole black peppercorns cloves allspice and bay leaves. We used apple cider vinegar at the table as my irish father was not a fan of the sour aspect. Your version sounds quite tasty E! I like the idea of adding cider vinegar at the table for people who might not be a fan of the sour aspect of the soup. Ohhhh my we have been making the white borscht from my grandmother nobody ever heard of it we have it every Easter morning for our breakfast would not be Easter without it so so glad u shared this my mom now has passed so I try and keep it going my brother and nephew and niece love it keep the tradition going on I’m just amazed I found this and how other people make there’s ?? Thanks so much for sharing Christina. What a wonderful way to keep your mother’s memory and heritage alive in your family! My mother used the kielbasa water, and then tempered a scrambled egg, cider vinegar witht eh sausage water to make the soup base. 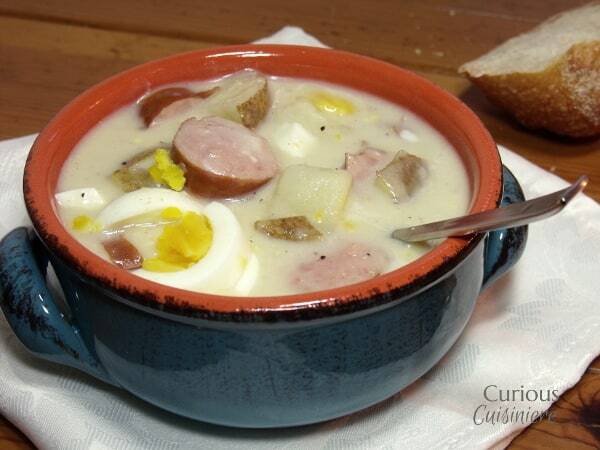 Hard boiled eggs, sour rye with caraway seeds, and kielbasa were cut up and added to the soup bowl. The soup base was poured over the meat, eggs, and bread and salt and pepper to taste. I still make it this way. The lielbasa was marianka (with marjoram) nice peppery taste. The tempered egg mixture also had flour. forgot. sorry. Thank you so much for sharing your family recipe Judy! It sounds delicious! Thank you for your note Anna. We’re so glad that you can bring this tradition back into your family and pass it on. Have a Blessed Easter! We make the barszcz with kielbasa, and hard . boiled eggs and vinegar to our taste. 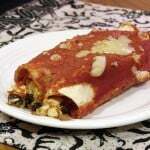 My Italian husband’s favorite! Sounds delicious Karen! Thanks for sharing! 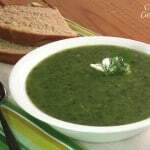 we use bosphina zupa : beet leaves, as recipe above. to bring in more flavor. hard boiled eggs, bay leaves, garlic and dill. Thanks for sharing your version Mary-Ann! That sounds like a wonderful soup! We’ll have to give beet leaves a try in ours! Thank you for comment Mrs. Barlik! The tang of vinegar and horseradish sound like a wonderful addition to the white borscht. It is sad that more people don’t know about white borscht, because it is such a tasty (and traditional) soup! We hope you had a wonderful Easter! Thanks for sharing your memory Linda! It’s so true that nothing ever compares to the flavors we remember. But it is so great for your kids that they can share in the traditions and memories, while making their own with you! How much vinegar and horseradish do you use? Do you mean the horseradish from the store shelf, or some form of horseradish sauce, like Hellman’s or so? This has always been our tradional Easter meal, on my mother’s side. Our dish has smoked ham, kielbasa and boiled egg. We add horseradish sauce to each individual taste. Entire family eagerly awaits this once a year treat! In fact, we’re enjoying it now, as I post this. Happy Easter! Happy Easter Carolyn! What a great idea to serve the soup with a horseradish sauce so that everyone can add it to their own taste! our EASTER borsch was made from the water after boiling a kielbasa , vinegar and flour added , my wife’s family was almost the same except they added sour cream , all as a base broth . That sounds very similar to ours! Using the kielbasa boiling water gives such great flavor to the soup! Hi Timea, The recipe does make a big batch, around 10 cups of soup. We typically serve 1 – 1 1/2 cup servings, which means this would serve 6-10. If you are serving it as a main dish, you may want larger servings (closer to 2 cups per person), so you might want to make a double batch just to be safe. We hope you enjoy the soup! A blessed Easter to you and your friends! I love that you included the history and meaning of the ingredients. Happy Easter and thank you for a delicious new recipe. Thanks Betsy! Happy Easter to you too! Hi Judy. We have not. But maybe another one of our reader has!